Ring Power has firmly planted its line of agricultural products with the cutting-edge technology and comfort of Challenger® and allied attachments. Ring Power offers the incomparable efficiency of Challenger's Ag Wheeled Series Tractors. 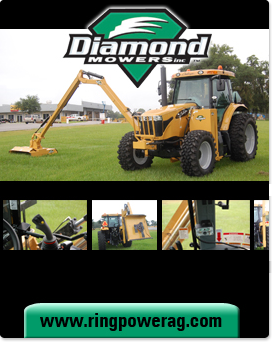 A variety of agriculture attachments and farm implements are available for all of the Challenger models. As Florida's leading supplier of the best farm tractors, agricultural equipment, attachments and implements, parts and service, Ring Power is the authorized dealer for Challenger®, Sunflower®, ROME®, Land Pride®, Terra Gator®, RoGator®, Diamond Mowers® and TOPCON® GPS Precison Ag.